Selling a lovely vintage 1840 - 1850 bodice made of a wonderful old printed fabric. 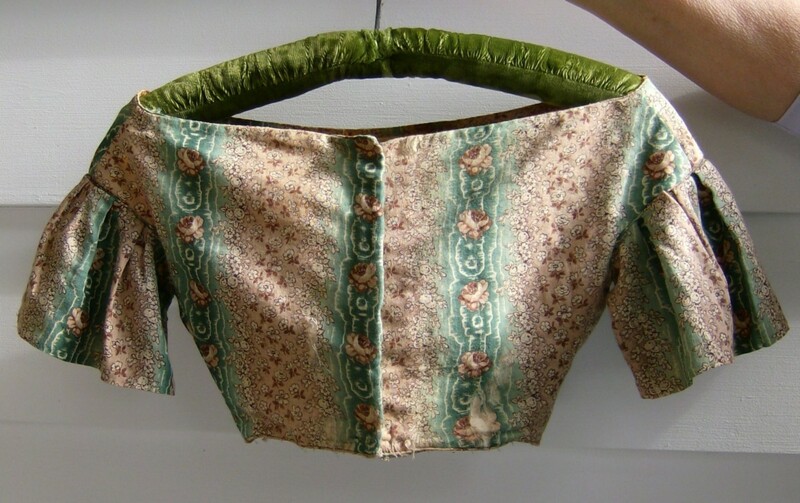 The wide, almost off the shoulder, cut of this piece is typical of this era. The sleeves are short and ruffled. It closes down the back with hook and eyes. 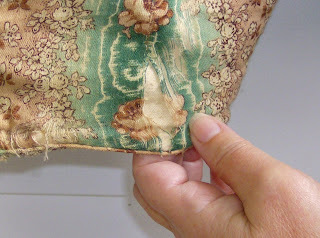 The fabric has large flowers in bands of green and smaller flowers in bands of brown. It has some fraying in two areas on the back, the largest of which we point out in our photos. We suggest this bodice be used for display rather than attempting to wear it or perhaps for pattern making. The neck openig measures 15", the bust is 14 1/2" and the length of the bodice from top to bottom is 9 1/4". 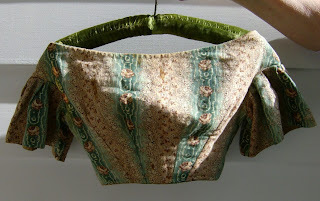 These mesurements were done with the garment laid flat.